With advanced minimally invasive therapies and high-quality medical service, St. Stamford Modern Cancer Hospital Guangzhou has helped many cancer patients defeat cancer and made numerous anti-cancer miracles. 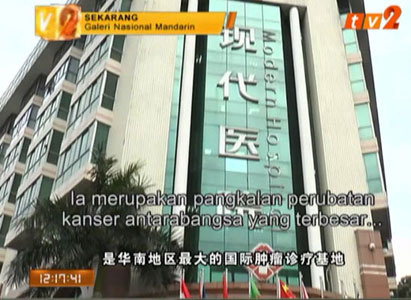 Medias in Malaysia has published many reports about St. Stamford Modern Cancer Hospital Guangzhou. On September 21st, 2016, TV2 detailedly introduced the minimally invasive therapies, medical services, environment and other aspects of St. Stamford Modern Cancer Hospital Guangzhou. On September 23rd, TV2 detailedly introduced one of the 18 the minimally invasive therapies—cryotherapy. On September 22nd, 2016, TV2 detailedly introduced one of the 18 the minimally invasive therapies—Interventional Therapy. 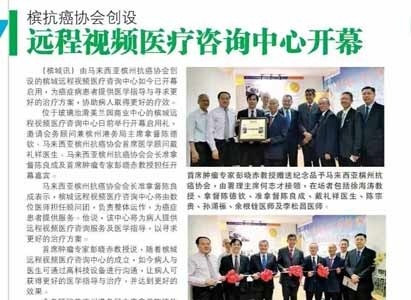 Malaysian China Press published a special report on the 17th National Academic Conference of Radioactive Seed Brachytherapy on June 22, 2017. 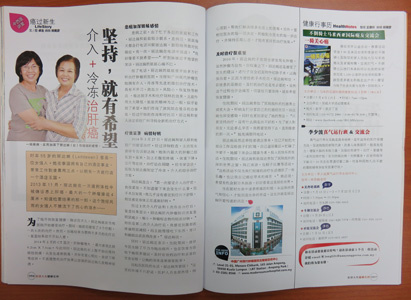 Malaysian China Press published a feature article on No operation, How to Treat Ovarian Cancer on Jun. 10, 2017. 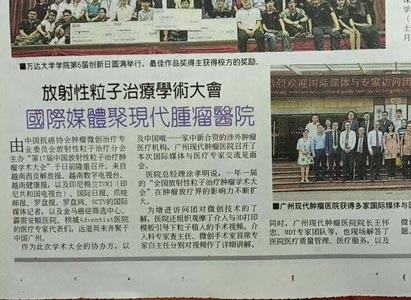 Malaysian China Press published a special report on Cervical cancer may not be the end of life on May 20th, 2017. On May 30th 2015, China Press published the feature of Pro. Peng Xiaochi and reported some stories of anticancer stars of May in Modern Cancer Hospital Guangzhou. 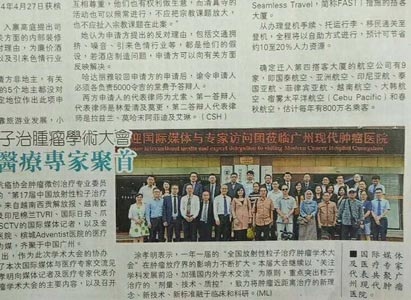 On April 22, 2015, China Press in Malaysia reported that Professor Peng Xiaochi, an oncology expert of Modern Cancer Hospital Guangzhou, taught people know more about lymphoma. Benny said: Thank you for your patience, love and care. You are a light that shines in the world’s darkness. 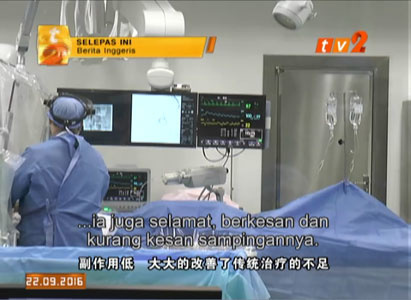 On April 8, 2015, China Press in Malaysia reported a story about HATTA, an anticancer warrior. HATTA, who did not want to take operation, found the best therapeutic treatment in Modern Cancer Hospital Guangzhou. 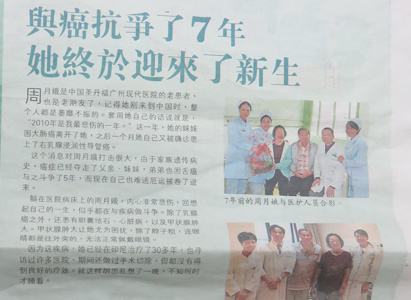 On Dec. 17, 2014, the report of Modern Cancer Hospital Guangzhou, Don’t Be Afraid of Cancer Recurrence, was published on China Press, the second largest Chinese newspaper in Malaysia. 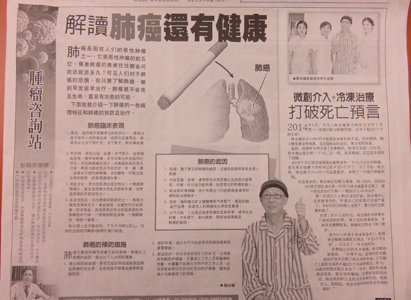 on November 22nd, 2015, China Press published a report about Modern Cancer Hospital Guangzhou, which introduced the clinical manifestation and prevention of lung cancer, as well the anticancer story of lung cancer patient DJONG NYAM SANG. 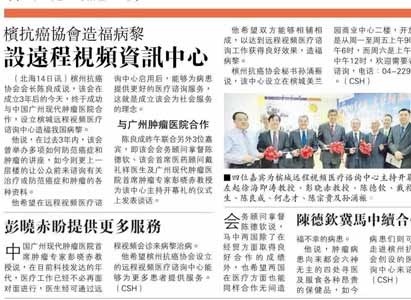 On Jan. 14, 2018, Malaysian Sin Chew Daily published a special report on Tan Yong Seng: Corporate with St. Stamford Modern Cancer Hospital Guangzhou and establish St. Stamford Guangzhou Modern Cancer Hospital Consultancy. 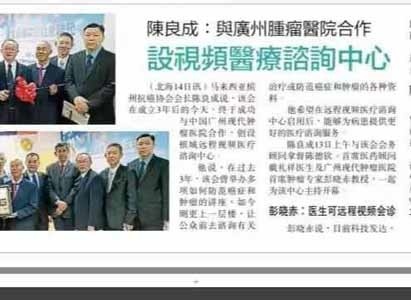 Malaysian Sin Chew Daily published a special report on the 17th National Academic Conference of Radioactive Seed Brachytherapy on June 22, 2017. 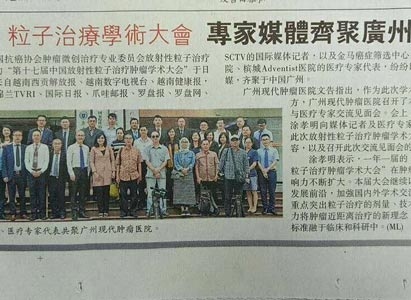 On June 7th, Sin Chew Daily published the feature on radioactive particle and chemical particle combined implantation. Experts of Modern Cancer Hospital Guangzhou, Peng Xiaochi and Bai Haishan explained this new anticancer technology in details. 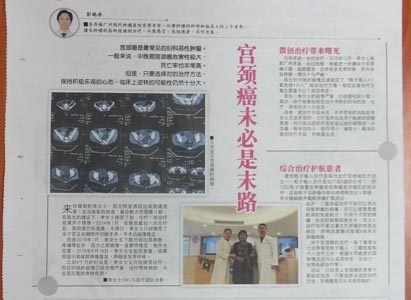 Breast cancer in stage IV relapsed so Nonglak Pomwara, Thailand patient, took minimally interventional therapy and cryosurgery therapy at Modern Cancer Hospital Guangzhou at 2014. 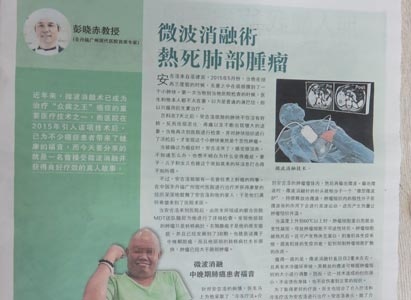 On April 16, 2015, Nanyang Siang Pau reported the anticancer story of Poutong Mr. Prajak who received cancer therapy at Modern Cancer Hospital Guangzhou. "Ms. Risma Idawaty Saragih was admitted due to postoperative endometrial cancer with metastases to liver and lungs for over 4 years. After interventional therapy and natural therapy in MCHG, tumors in her liver disappeared." says Nanyang Siang. On Jan. 22, 2015, the series report of Modern Cancer Hospital Guangzhou, Breast Cancer Is Not Incurable, was published on Nanyang Siang Pau. On April 30th 2015, Nanyang Business News reported an anticancer story of Vietnam liver cancer patient, NGUYEN THI BAM. After cryotherapy and natural therapy, her condition was in good control. 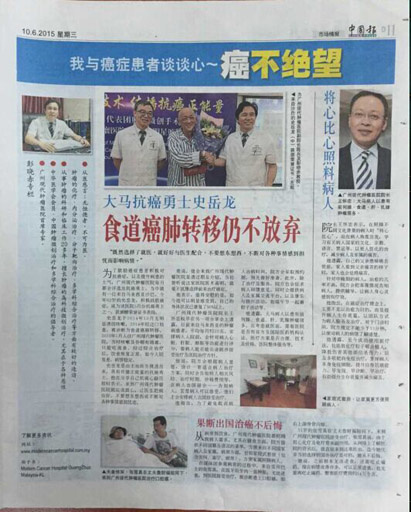 On Dec. 11, 2014, a thank-you letter to Modern Cancer Hospital Guangzhou from father of Lao lymphoma patient Thipthida Xayasena was published on Nanyang Siang Pau and has drawn great public attention. On August 12th, 2015, Guang Ming Daily published an article to help cancer patients better fight against cancer. 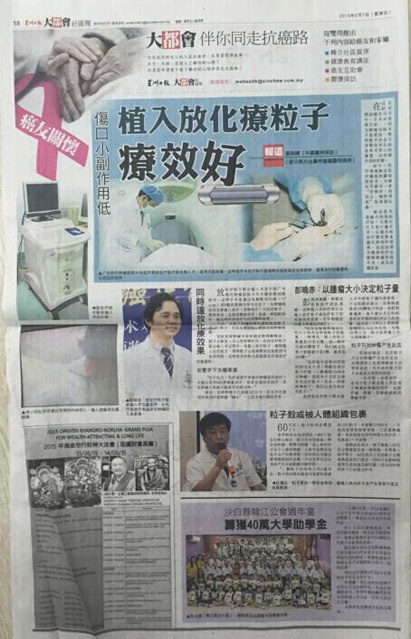 On April 8, 2015 Guangming Daily in Malaysia reported the feature of “radioactive particle implantation of malignant tumors” and introduced anticancer technology of radioactive particle implantation in details. 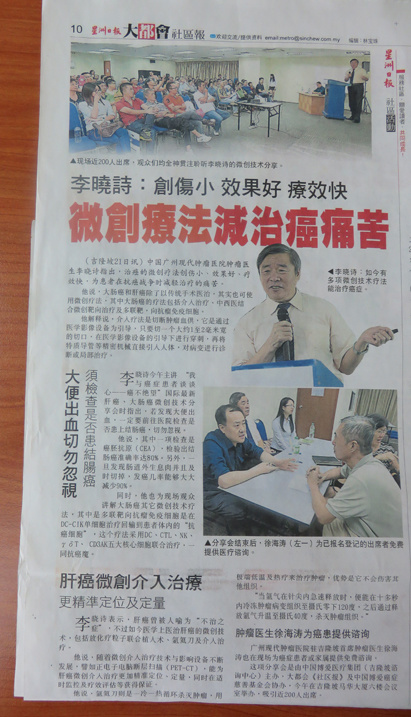 On April 8, 2015, at Guangming Daily in Malaysia Professor Liu Lvguang discussed about three-level precautions of breast cancer, cervical cancer and ovarian cancer. On Jan. 14, 2015, the series report of Modern Cancer Hospital Guangzhou, Don’t Give up Hope, was published on Guangming Daily. On April 12, 2015, the first “Academic Forum of ASEAN Tumor Minimally Invasive Therapy ” was successfully completed in Bali Island. New anticancer technologies & treatments were conveyed in the forum and many cancer patients shared their stories. 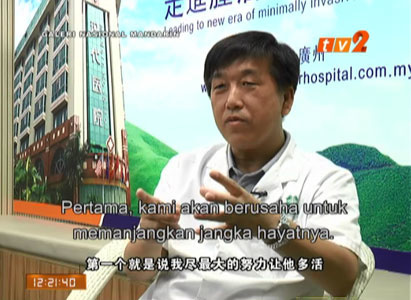 On April 22, 2015, the GuangMing Daily reported the anticancer story of Malaysia cancer patient, Huang Guohua. Huang Guohua received Ar-He knife therapy and minimally interventional therapy in Modern Cancer Hospital Guangzhou China. Nguyen Huu Thang, the liver cancer patient from Vietnam, proved that if one treated his cancer rightly and positively, it is possible to achieve a five-year survival. On Jan. 21, 2015, the series report of Modern Cancer Hospital Guangzhou, Treating Prostate Cancer with Integrative Treatment, was published on Guangming Daily. 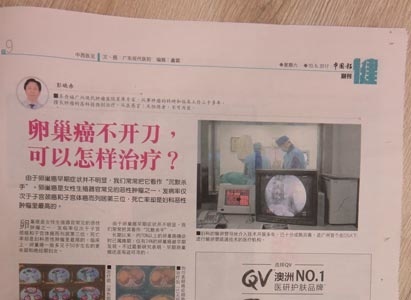 On Dec. 10, 2014, the series report III of Modern Cancer Hospital Guangzhou on its minimally invasive therapies, Say Goodbye to the Desperation, by Guangming Daily was published on the eighth and ninth pages of the newspaper. 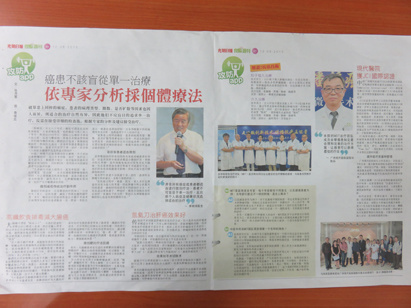 On Dec. 11, 2014, the series report IV of Modern Cancer Hospital Guangzhou on its patient-oriented service, Respecting Overseas Patients’ Culture and Customs, was published on the third pages of Guangming Daily. In July, 2015, Malaysia Long Life reported an anticancer story of the liver cancer patient Laddawan. After Laddawan received treatment in Modern Cancer Hospital Guangzhou, her 9cm tumor shrank immediately and got a good treatment effect. On Nov. 2 2017, Malaysian ovarian cancer anti-warrior Yao Caifeng’s story was published on Oriental Daily News Malaysia in the page of Anti-Warrior.